Our program offers a joyful, horizon-broadening experience for our clients whether it is through life skills training, dance, music, exercise, pet therapy or trips to experience the many cultural, educational and entertainment opportunities that our community provides. We have the good fortune of being located in a wonderful town that welcomes us at the pool, the gym, the library, the bowling alley and all around town. Programs at The Opportunity Center focus on clients’ continued personal growth, promotion of self-esteem, and the enhancement of abilities to encourage each individual to achieve his or her highest potential. Depending upon a client’s skills and abilities, staff members work to further develop the clients’ intellectual skills. Studies range from basic reading and writing skills to the arts, history, geography, current events and independent living. Participants’ interests and skill levels are taken into account in developing appropriate subject matter for study. Other elements of our program help clients to achieve a greater degree of independence in their lives. These include hands-on “classes” on cooking and other life skills, shopping trips, health education and speech therapy. We also have a number of computers that our clients use; many of the games they play have educational objectives. We explore our creative sides through a variety of craft projects, such as the toothpick sculptures and quilts that were recently exhibited at the Fair Lawn library. Clients also enjoy opportunities to learn about horticulture by helping out in our own garden and can experience the miracle of life and growth, starting from a potato in the classroom that becomes a fully-grown plant in the garden by summer’s end. A broad variety of talented people from our local community visit The Opportunity Center to help clients improve their physical well-being through activities such as yoga, Tai Chi, Zumba and dance. 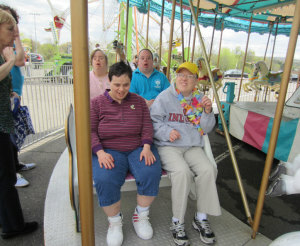 Thanks to the supportive communities that surround us, we also have many nearby opportunities for clients to exercise and have fun outside of the Center whether it is bowling, swimming or engaging in other physical activities at the Fair Lawn recreation center. Music therapy is a significant part of our enrichment program at The Opportunity Center; musicians frequently visit the Center and play a number of musical instruments in a variety of musical styles for our appreciation and listening pleasure (although if you stop by, you may find us up and dancing to the music rather than just sitting and listening). We have the good fortune of living in a region that offers many opportunities to see shows, visit theaters, museums, zoos, nature centers and our local library. We take frequent advantage of these opportunities. 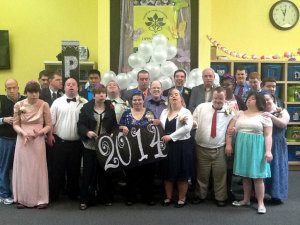 We are a family and, like most families, we enjoy celebrating holidays, birthdays and other special events like our annual Prom. Our newly-renovated kitchen gets a workout as our clients participate in helping to prepare dishes for our holiday celebrations. And because holidays wouldn’t be complete without proper decorations, we have a lot of fun creating festive decorations to celebrate holidays at The Opportunity Center. While our clients come to us with a wide range of skills and abilities, we encourage everyone to participate at whatever level they are able to but most of all to enjoy and take pride in that participation.